Karen Aston has coached 227 basketball games at Texas and is still searching for her first moral victory. Of course, she wasn’t hired at a tradition-rich national program just to come close. 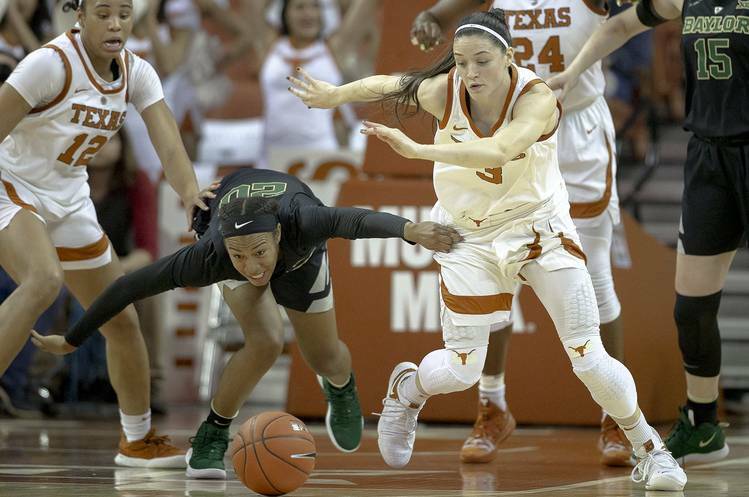 Such was the case when top-ranked Baylor held off a late Longhorns stampede to post a 74-68 victory Monday night at the Erwin Center. “Losing is painful, regardless,” Aston said. Indeed, any good vibes that Texas players and coaches might have felt were masked by one obvious shortcoming: Baylor has now beaten Texas 19 times in the last 20 matchups of the old rivalry. In defeat, though, 5,393 fans were treated to a fabulous comeback by the home team. Trailing 61-40 entering the fourth quarter, the 14th-ranked Longhorns came alive. With transfer guard Danni Williams hitting long-distance shots and point guard Sug Sutton spearheading a frantic rally, Baylor’s lead was sliced to 70-66 when Sutton hit a pair of free throws with 35.7 seconds to play. Baylor, though, received clutch free throws from Moon Ursin and Chloe Jackson down the stretch to preserved their 32nd consecutive Big 12 road victory. Texas, which outscored Baylor 28-13 in the final quarter, was led by Williams, who scored 10 of her 19 points in the final 10 minutes. Sutton finished with 19 points and six assists. Baylor showed why its ranked No. 1 in the country by taking early momentum. Ursin, a reserve guard, had a team-high 20 points. The Lady Bears earned a 41-28 rebounding edge, including 17-4 on the offensive glass. They had a 15-4 advantage in second-chance points and a whopping 24-6 edge in bench points. Texas did a valiant job guarding 6-7 All-American Kalani Brown; the senior scored a mere two points in the first half. Her teammates did a better job of giving her the ball in the second half and she finished with 15 points. It’s not the first time Baylor has taken an opponent’s best punch and won a game, coach Kim Mulkey said. She admitted making one tactical error: Going into an offensive stall too early. Texas returns to Big 12 action Saturday night at Kansas. That will be followed by a road game against Oklahoma State next Tuesday. The Horns played their third straight game without freshman Audrey Warren, who remains on concussion protocol after getting hurt at Texas Tech on Jan. 26.